25 more cards will get made in January...February, stay tuned ! T-04YBSC is intended to be the ultimate YMF71x (OPL3-SA2x, OPL3-SA3x) based sound card out there, made with no compromises on sound quality. I got fed up with all the crummy YMF71x based cards out there and designed my own based on reverse engineering and experimentation to characterize the chips and figure out most optimal circuit and layout for them. I also wrote my own software to make use of everything in most nicest way, vastly improving on all existing solutions. * Windows Sound System, mostly CS4231 compatible. * Sound Blaster Pro 2.0, supporting most features of the real deal. * One MPU-401 UART wired to WaveBlaster header and GamePort. * Second MPU-401 UART wired to YMF721 based MIDI ROMpler. * Two OPL3L, one in YMF719 and one in YMF721. Compatible with OPL2 and OPL3. * Covox Speech Thing support. Uses YMF719 Microphone line. * Secondary IDE port with PIO based access for stuff like CD-ROM drives. * WaveBlaster header that can accomodate all the goodies. * Fully functional GamePort with MIDI I/O and a polyfuse on the 5V line. * Dedicated headphone output with a proper amplifier, can drive even 4 ohms. * AC97 compatible front panel audio connector (lacks microphone support). * Proper Line-Out with near 5Vpp output capability. * Proper Line-In capable of 5Vpp signal input. * PC-Speaker input. Repurposes Mono-In line of YMF719. * Software controlled component and system resources management. * YMFDEC, a custom CPLD that allows software control of various components. I have made a few oopses along the way that required a patch wire, cut trace and misaligned TRS connectors so that I actually had to cut things to make them fit (you can take a look at the photos on my site). As with other sound card projects I have seen here, the metal bracket is big problem, I don't have any to supply and due to the oops only Aztech card's brackets will have the closest fit without cutting the connectors slightly. I have the intention of selling the 10 prototypes I can make so I can raise some money to do the final version with all the problems fixed in a way that no cut traces and patch wires are needed, plus I am pretty much completely out of money and unable to pay the bills I'll be getting next month... everything is very much on these things right now ! I have 10x PCBs but not enough YMF721 chips to give all cards one, so some that I can build will have missing MIDI chip and will be cheaper because of it too. I am capable of producing hundreds of the final version and I hope that there will be interest, you can also see the photos of the build process on my site. I will also create these as long as there's interest, I have no intentions of letting scalpers get excessive amount of dorrals from these things. I'm not totally sure yet on how much I will want per card, or at least per prototype, I don't really want to be greedy either. Seeing what others ask for things that provide much less functionality I'm thinking of 100€ range for the full featured thing plus whatever shipping is to the destination country. I'll have to build the remaining prototypes first also, so I have some time to think about it. Since there's room for a new revision I am also thinking that people with most amount of hardware to test things on get priority on the prototypes. I will not be making kits and most people aren't super experienced with surface mounted parts, especially on the density the card has. Hardware aside, there's also the SETYMF utility that goes together with the card that allows all the things to be set up properly and conveniently. You can use this software with other YMF71x based cards also. I can do recordings of games not listed, my collection of games isn't all that big though. Any questions or comments ? I'm all ears ! Last edited by Tiido on 2018-12-30 @ 02:02, edited 2 times in total. I've been watching this project come together over the months and I just wanted to say, congrats! I'm really happy about how this has progressed and the discoveries you've made. I'd love to get on board for one of these. I have become to call that the "reset bug". I have also noticed it on some other YMF71x based cards on those machines but not on others, I have not found any electrical difference between the cards and it seems when I transplant the chips from one card to another the problem doesn't move with the chip. I have done things like isolating bus signals and other things after setting up the card and yet I seem to be getting these "resets". Manifestation is that the mixer appears to reset to default state (very quiet with most inputs muted), IRQs seem to stop happening and whatever was last playing ends up looped on SB side or goes silent, games seem to go super slow too. IO assignments seem to stay intact and stuff like MIDI and Adlib music continue playing albeit very quietly. It seems to only happen on ISA/VLB based 486 machines, I haven't had it happen on 386 and 286 machines. Also when ISA bus is behind a bridge like on all Pentiums and 486 machines with PCI slots there are no problems whatsoever so my only guess is that some bus cycle on the ISA bus will confuse the card or something. I have been unable to see any timing violations on oscilloscope on those machines compared to 386 and 286. Bus speed and amount of wait states seems not to play any role either. Whoever can figure it out will get a free card. wow I totally missed this thread! excellent work Tiido! are you going to sell this soundcard? How could i have missed this too?? I'm the biggest YMF fanboy ever!!! OMG, and the software looks nice too!!! Any chance of getting SPDIF output from this card? Looks great, BTW. Anyway yes, I plan to sell these, hopefully 100 range. I need the dorrals to make more stuff and cover my bills business for a little while too hahaha. Once I have managed to sell the prototypes (most are actually reserved now) I'll have some money to get a revision made which has all the manual fixes added and oopses corrected. I'm not totally sure how to go about larger scale of things though, PayPal technically doesn't allow to ask money for things that don't yet exist (new batch would essentially be preorders) but I do not have the money to order parts to build the new things without having some amount in advance pretty much. I wonder how the ARGUS handled this part ? Also like ARGUS I lack the metal bracket, perhaps some forces could be joined on that front ? More will bring the cost down a little. There's no way to get SPDIF outside sticking an ADC on the final output. The analog side of this card is most excellent so there's nothing to win by doing that . Last edited by Thermalwrong on 2018-7-23 @ 00:57, edited 1 time in total. This looks like a very interesting design. Your pictures show a YMF704, but your descriptions say YMF721. Which one will your final design use? I ask only because I've been rather curious about the 704. My limited budget means that I will have to wait, but I may be interested in picking one up when you offer the final version for sale. Tiido wrote: Also like ARGUS I lack the metal bracket, perhaps some forces could be joined on that front ? More will bring the cost down a little. As far as I know, I am the only one who has been in contact with a manufacturer of PCB backplates/brackets. For custom jobs (which is just about everything, since their selection of "standard" brackets is limited), they have a minimum order of 500 units. Once we know how much it would cost to produce our design, we will be in a position to discuss the details. It is not at all certain that an order of custom brackets will be at all affordable. I may look for additional quotes from other manufacturers, to see if I can find something more reasonable. When I have some news, I can always let you know what I find, if you're interested. Tiido wrote: I'm not totally sure how to go about larger scale of things though, PayPal technically doesn't allow to ask money for things that don't yet exist (new batch would essentially be preorders) but I do not have the money to order parts to build the new things without having some amount in advance pretty much. I wonder how the ARGUS handled this part ? I got involved in the project quite late, so I may not have all of the details. My understanding was that donations were made to fund the initial bulk purchase of the InterWave chips and some of the parts/design work. Those donations entitled people to order up to three cards, when they are ready for general production, so it's somewhat limited availability. Prototypes were made available for purchase as bare cards, again to donors or those contributing to the project. So far, full price for the cards has not been collected, nor final orders submitted. Clearly, testing work and some minor revisions are still on-going. There is no guarantee, but I suspect some cards may be made more widely available afterwards, if there are InterWave chips left over. If that happens, I expect the price will be a good bit higher than what the donors/contributors pay. This part is all speculation, of course. Since the initial payments were donations (not sales), PayPal didn't have anything to complain about, and the prototypes were pre-orders for a physical card. I suspect the final orders to be handled similarly. To which "OPL4" are you referring? If you mean the earlier YMF278B, then it doesn't look like there is a footprint for the wavetable ROM and/or SRAM that generally goes along with that chip. Also, the software would have to be somewhat different for the 278B. 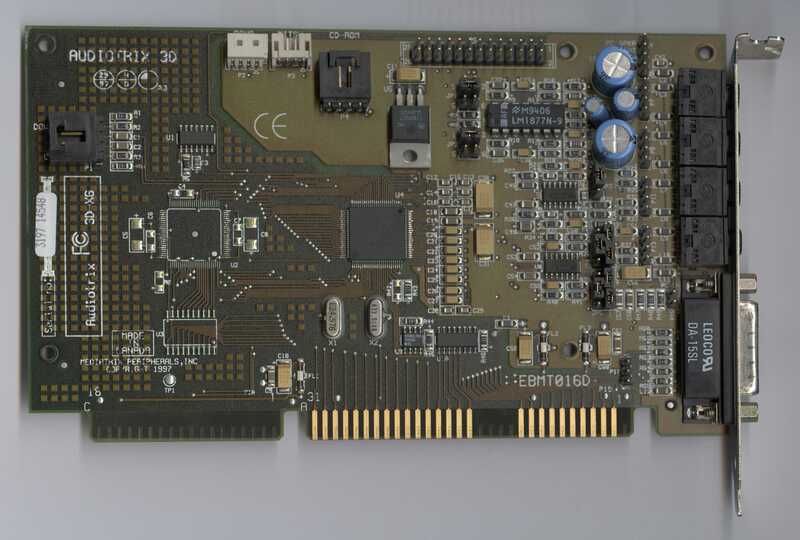 I think it's a bit wasted in that system and I don't like the audio quality of that board very much, so Tiido's card is ideal for what I wanted to do, then I can use it in my K6 / Tualatin systems instead. I could make a board without YMF704/721 that you can then populate yourself in the next batch. Not sure if the small capacitors get in the way or not. I finished making all the prototypes today and I didn't add DAC and other components needed to those without YMF721/704, roughly 30 components less. A YMF278B wouldn't work, even if pinout was same. YMF704/721 is YMF278B + CPU + some RAM + UART + sample ROM, all in one solution for MIDI stuff (albeit not a super great one, it was never meant to be anything awesome). 640K!enough wrote: This looks like a very interesting design. Your pictures show a YMF704, but your descriptions say YMF721. Which one will your final design use? I ask only because I've been rather curious about the 704. My limited budget means that I will have to wait, but I may be interested in picking one up when you offer the final version for sale. The very first card I did uses a 704 taken from one other Yamaha based sound card, the others use a 721 from my stash and I intend to use a 721 on final version. It seems only difference between them is power down support on 721 and 721 not actually respecting the reset polarity signal (only active high reset works while on 704 you can use either type, determined by polarity selection pin), sample ROM is same and I doubt there's any changes either on CPU side either, they both sound identical on all things I have listened. 640K!enough wrote: As far as I know, I am the only one who has been in contact with a manufacturer of PCB backplates/brackets. For custom jobs (which is just about everything, since their selection of "standard" brackets is limited), they have a minimum order of 500 units. Once we know how much it would cost to produce our design, we will be in a position to discuss the details. It is not at all certain that an order of custom brackets will be at all affordable. I may look for additional quotes from other manufacturers, to see if I can find something more reasonable. When I have some news, I can always let you know what I find, if you're interested. I'm definitely interested, hopefully the cost won't end up being really huge. I have looked at some DIY approaches and it won't be cheap in any way, plus nobody is willing to do any small amount either. 5ish € per bracket is a bit too much. 640K!enough wrote: I got involved in the project quite late, so I may not have all of the details. My understanding was that donations were made to fund the initial bulk purchase of the InterWave chips and some of the parts/design work. Those donations entitled people to order up to three cards, when they are ready for general production, so it's somewhat limited availability. Prototypes were made available for purchase as bare cards, again to donors or those contributing to the project. So far, full price for the cards has not been collected, nor final orders submitted. Clearly, testing work and some minor revisions are still on-going. That's good to know, I was wondering how things got started there. I'm pretty much at the end here, apart from one serious bug I've not been able to figure out and possible enhancements to the SETYMF. I just need dorrals to order the parts and I can start building them in quantity. For people in EU, SEPA payments would work out best but anyone outside EU would have pretty ginormous extra cost on an international bank transfer. PayPal will probably not like the idea of large sums flowing in guise of a donation either. I'll have to contact them and ask about the matter to know what options are there that don't upset anyone. 640K!enough wrote: There is no guarantee, but I suspect some cards may be made more widely available afterwards, if there are InterWave chips left over. If that happens, I expect the price will be a good bit higher than what the donors/contributors pay. This part is all speculation, of course. I can image all those getting scooped up immediately. When/If that time comes and my wallet is not in a sorry state I'd like to get one. 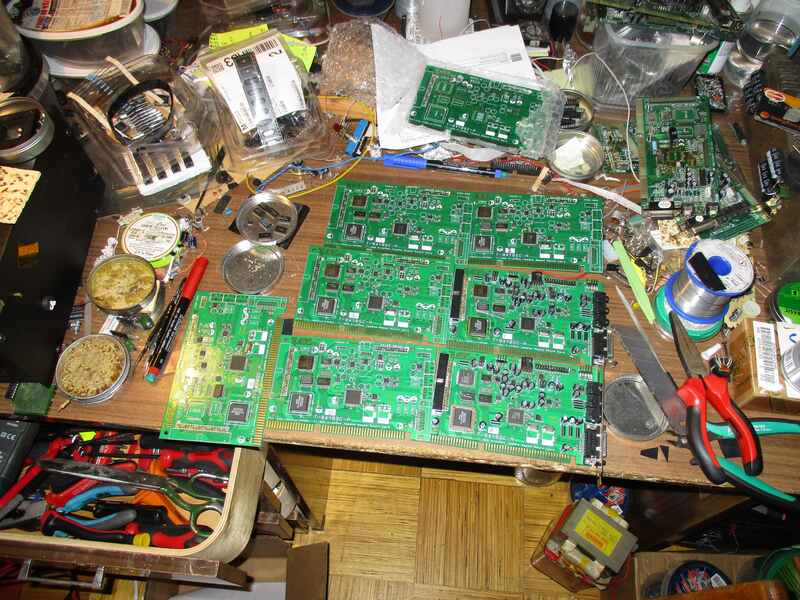 I could possibly source the parts myself and populate a board myself also, making few more PCBs wouldn't be a big problem I imagine. Hi Tiido! Really nice to see you here! I wrote you some time ago about your patch for the Portwell RUBY-9719VG2AR, you helped me out, and my friend and I even started designing a fork that's been on hold for quite a while now. I really admire your hardware endeavours, and this one excites me most! First, I'm willing to donate and get a full function pre-built 719/721 board, takemymoney.jpg! 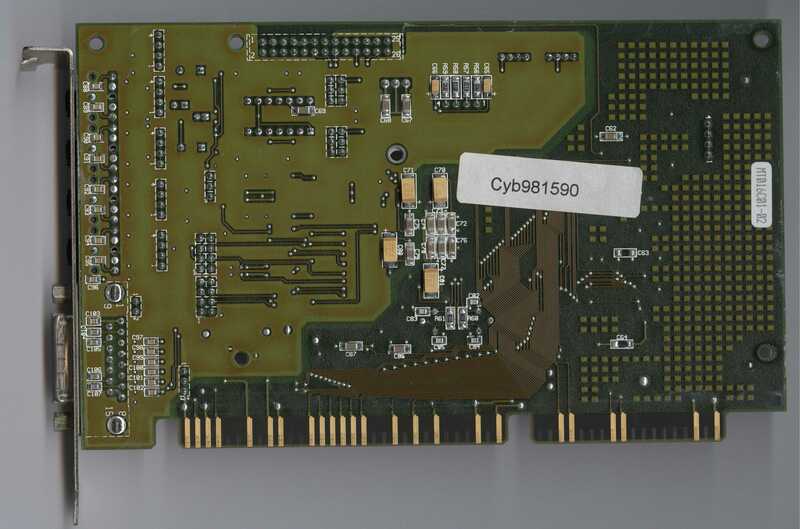 This card was also bundled with a DB60XG daughterboard, and the card was designed so that the PCM and OPL3 were routed through the DB60XG analog inputs and outputs. This would allow the signal to be mixed with some effects provided by the DB60XG. So, apparently it's already too late to introduce major changes into your design, but still as you don't have the commercial batch produced yet, maybe it could still be possible? Adding this custom routing from AudioTrix with the corresponding DB60XG effects initialization in your software will just make your card a true King! Awesome to see you working on PC and DOS stuff these days. Looks great, I definitely want a card out of this project. Beautiful card and excellent its own soft! It's a nice idea to put Yamaha's SFX and WT DSPs onto the one PCB. hard1k wrote: my friend and I even started designing a fork that's been on hold for quite a while now. I know why, White told me. Exactly the same bug is present on ASUS M2V board. Why don't you ask Tiido about this issue? Maybe he knows how to fix it on Portwell board. hard1k wrote: So, apparently it's already too late to introduce major changes into your design, but still as you don't have the commercial batch produced yet, maybe it could still be possible? Adding this custom routing from AudioTrix with the corresponding DB60XG effects initialization in your software will just make your card a true King! P.S. If you need an AudioTrix 3D-XG board on hand to examine how the routing is done there, I can lend you one (of course, any damaging reverse engineering will be strictly prohibited ). PARUS wrote: I know why, White told me. Exactly the same bug is present on ASUS M2V board. Why don't you ask Tiido about this issue? Maybe he knows how to fix it on Portwell board. As I'm currently too far away from my hardware and as I have zero free time to play with it, I've decided to postpone this conversation I guess, if White was interested in any further progress, he could take the lead himself. hard1k wrote: Hi Tiido! Really nice to see you here! I wrote you some time ago about your patch for the Portwell RUBY-9719VG2AR, you helped me out, and my friend and I even started designing a fork that's been on hold for quite a while now. What sort of bug ? I have also updated my program a little, to support more IO ranges by making better use of the range forwarding mechanism. hard1k wrote: I really admire your hardware endeavours, and this one excites me most! I also want to roll out my own WB module + ISA card hybrid but that will take a bit more time as instrument creation is nowhere near as easy as hardware . It will synthesize as many sounds as possible also, nothing beats realtime generated sounds ! I have time right now, but not the money and this card is to get me to a point where I have the money too. I am aware of that card and I see it as no sort of competition when I saw the analog sections of it. Stuff like tantalum capacitors in audio path are a big no no, but at least the opamps are ok compared to what most other cards use. DB60XG also has very poor DAC+ADC chip compared to modern things out there, I even modified mine to get rid of ADC input (wired the output to logic zero) and gave it a new DAC so that it wouldn't massively increase (like +12db !) the noise floor on my card hahaha. That thing is a hiss monster in stock state. Effects processing is all or nothing like on Yamaha SW20PC that I have and I have found it to be a nuisance rather than anything useful outside music of games. Even though I don't have that card I am more than certain that it will not be able to rival mine in THD figures seeing what its analog section is like and having the highest possible sound performance is the main goal of the card, so I stand by my claims hahaha. The next revision is not yet finalized, I could add some DIY things to ease adding such functionality like few test spots so you can solder a few wires here and here and get such effects business going though. I will keep that in mind. I am really intrigued about the ISA/VLB vga , I hope you get to make it soon! There's also a software aspect involved, the video BIOS which will be the hard part for me. 1) x86 is terrible A) I don't actually know all the things that video BIOS must do. VESA stuff will also have to be entered into the mix. Maybe in future when I can make Windows drivers I can enter hardware acceleration functions too but that's think too far ahead . Aren't DVI/15k done with external encoders anyways? I seem to remember in the beginning of DVI there were discrete encoders - for 15k downscaling you'll have to do your own one AFAIK.